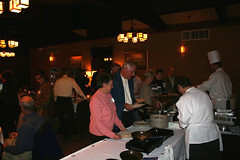 On November 16, we had our annual fundraiser. This year’s event took place at the Athens Community Center. Both a breakfast and lunch were served featuring local and organic foods. We had over two hundred gusts in attendance. 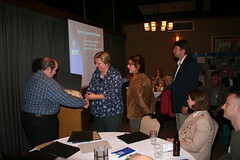 Below is a slide show of the events as well as some behind-the-scenes photos showing the staff in action. On Friday November17, the Youth Act Club at Federal Hocking Middle School raised money and canned foods at a dance benefit for My Sister’s Place, a domestic violence shelter and hotline serving Athens County. 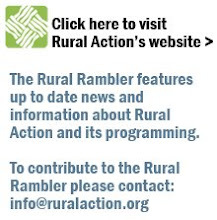 Youth Act members proposed, planned and implemented the project. Among other things, they helped create the dance budget, publicized the event, and worked to staff the various booths during the event that brought in the bulk of the money. The benefit brought in 66 canned foods for the shelter and over $260, approximately $70 of which was profit that will be donated to My Sister’ Place. On the morning of the dance, a representative visited the Youth Act group from the organization, speaking about My Sister's Place’s services and helped the students learn about healthy relationships. This week, through presentations to other clubs, the youth will share with the school what they learned about My Sister’s Place and the successes of their benefit. In the near future, the Youth Act Club will present a representative of My Sister’s Place with the proceeds of the benefit. The Harsha North Reclamation Project was completed during the summer of 2006, ahead of schedule and within budget. The purpose of this project was to reduce the impacts of acid mine drainage (AMD) draining off of the Harsha North site into Huff Run. The project area was approximately 23 acres. Over 58,000 cubic yards of earthwork was excavated and redeposited. 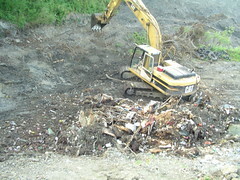 During this project, 300 tons of debris/trash was encountered, hauled off site, and disposed of at an approved location. Two existing impoundments of over 720,000 gallons of acid water were treated and dewatered; a third was modified and is now being utilized as a settling pond. A 1,100-foot channel located at the highest point in the project was constructed using a new product that the ODNR has not used before. 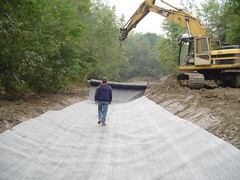 It is a geosynthetic clay liner, necessary because the existing soils in the area were toxic and by using this liner no water will come into contact with the contaminated soils. The rolls weighed so much that a special devise had to be fabricated to unroll and install it into channel. It was then covered with limestone. Before the project, water quality leaving the site had a pH of 3.5 and iron content of 9mg/L. Upon completion, the water leaving this site has a pH of 7 and iron content of 2mg/L. Whoops! 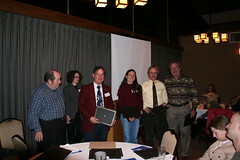 These pictures of Huff Run’s 10 Year Anniversary Banquet were accidentally left out of the last edition of the Rambler. You’ll find them below. Yeay, Huff Run! What a great (and yummy) night. Thanks to all who helped and attended!